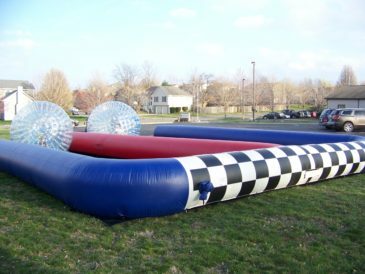 Step inside our clear inflatable hamster ball and race down and back on our inflatable track. The player or first team to cross the finish line wins! 1 dedicated 20 amp circuit within 100'. CC&E will provide heavy gauge extension cord. Grass or indoor placement only. If indoors, remove center bar in double door for entrance on ground level.